On Monday night, Jason Hawes and Grant Wilson from The Atlantic Paranormal Society (TAPS) and SciFi show Ghost Hunters were in St. Louis at the downtown library. I enjoy the show so decided to stop by and see them. Turns out I’m not the only one around who watches the show. They had around 1,000 people in the library and another 300 or so they had to turn away due to building capacity and fire code issues. I missed getting in the room where they were by ~40 people, so I wound up in the overflow room (which was much larger than the main room). They had a video feed setup, although we didn’t actually get to see them but rather the video from their laptop presentation along with audio. The presentation was entertaining. They stress they’re just a couple of plumbers and aren’t great public speakers, but they were engaging, informative, and funny. They talked about how they will investigate a location over a week when filming and then it gets edited down to make it look like a single night. They also don’t have much control over the editing process. They have a book out that talks about some of their cases and gives you more info about the things that were left on the cutting room floor. Afterwards, there was a meet and greet line where you could get something signed and have a photo taken. I didn’t have their book or anything else, so I just had them sign the flyer for the session. I was near the end of the line and didn’t get up to them until around 10 PM. I asked how they were holding up and Jason said that it was good to see the end of the line since it meant they could get something to eat and sleep. They arrived in town right before the session started, so they had to have been dragging after four hours. 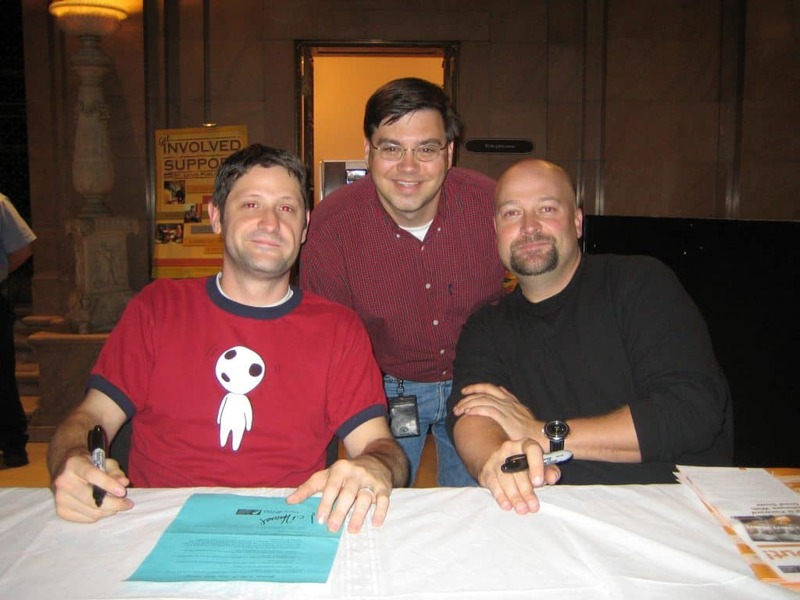 Scott with Grant and Jason from the SciFi series Ghost Hunters. Taken at the St. Louis Public Library.